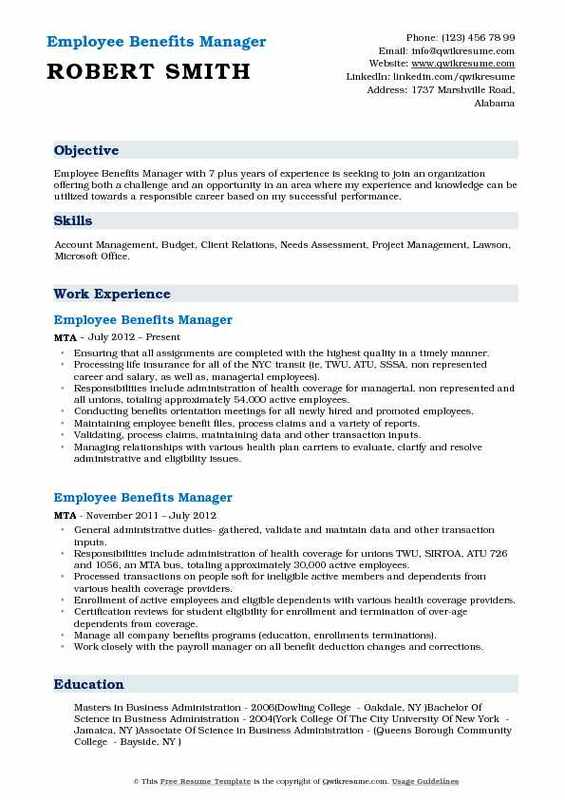 Benefits Manager analyzes, administers and designs the employee benefit programs for an organization. 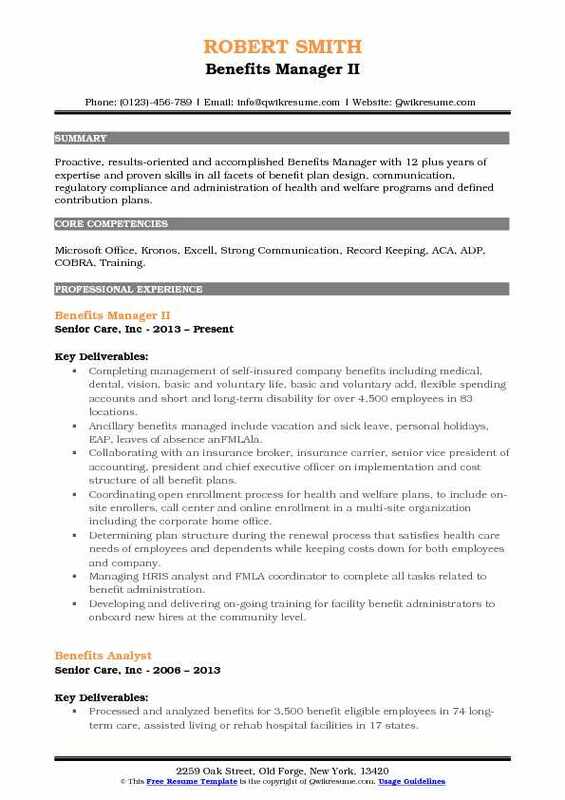 The Benefits Manager Resume typically focuses on exhibiting job roles and responsibilities such as counseling employees regarding benefit programs and the plan coverage, new hire benefit orientation, updating benefits website, managing new implementations, testing the new systems, administering annual benefit and compensation programs, evaluating and negotiating with service providers like insurance company and handling all reimbursements procedures. 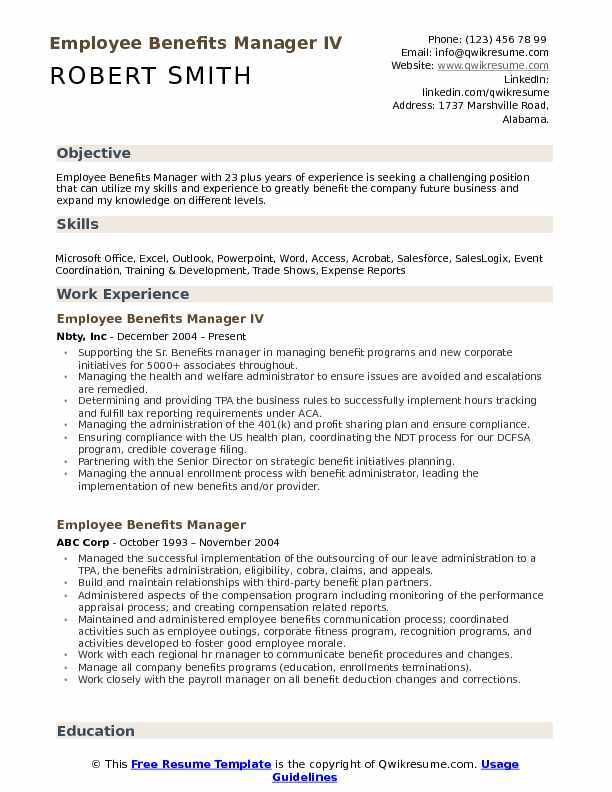 Benefits Manager should demonstrate in the resume skills and qualities such as experience in ADP human resource, solid understanding of benefit plans, proficiency in MS Office and HRMS systems and outstanding interpersonal and negotiation abilities. 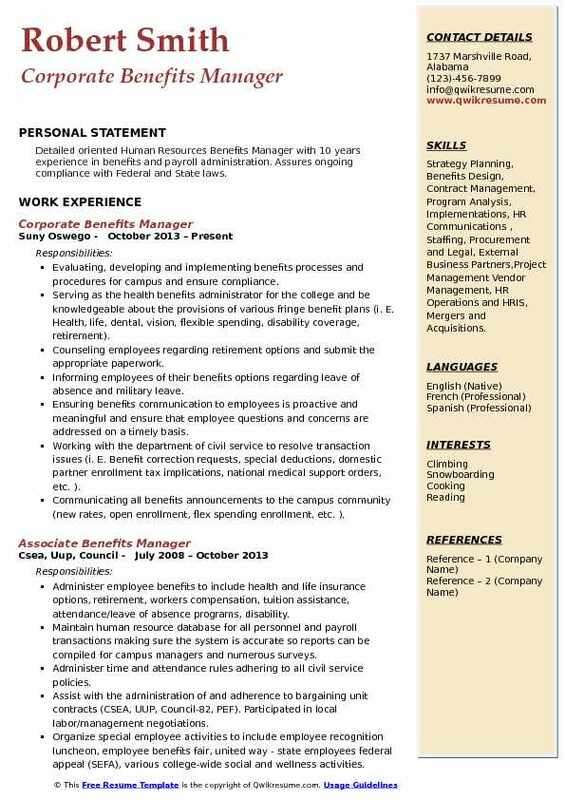 Eligible resumes must display a degree in the field of human resources, business administration, finance or the related to be considered for this employment. Summary : Employee Benefits Manager with 23 plus years of experience is seeking a challenging position that can utilize my skills and experience to greatly benefit the company future business and expand my knowledge on different levels. Supporting the Sr. Benefits manager in managing benefit programs and new corporate initiatives for 5000+ associates throughout. Managing the health and welfare administrator to ensure issues are avoided and escalations are remedied. Determining and providing TPA the business rules to successfully implement hours tracking and fulfill tax reporting requirements under ACA. Managing the administration of the 401(k) and profit sharing plan and ensure compliance. Ensuring compliance with the US health plan, coordinating the NDT process for our DCFSA program, credible coverage filing. Partnering with the Senior Director on strategic benefit initiatives planning. Managing the annual enrollment process with benefit administrator, leading the implementation of new benefits and/or provider. Assisting in the preparation review and execution of associate communications and educate HR and associates on the annual enrollment process and benefit updates. Responsible for managing international employee benefits programs for 200 employees United Kingdom, South Africa. 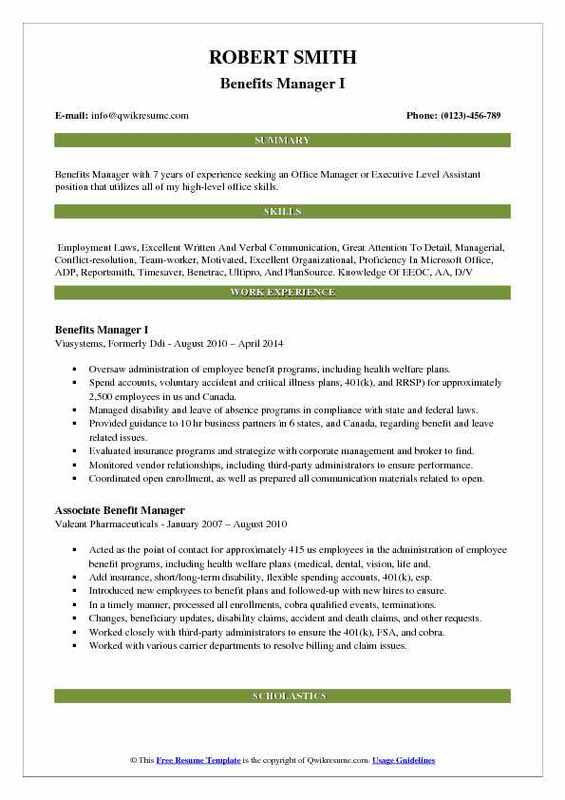 Summary : Benefits Manager with 17 plus years of experience in operations, leading Human Resources involving implementation and growth organizations. Results oriented while executing processing and client escalations. Excel in dynamic, demanding environment while staying focused. Administering various employee benefit programs, such as a self-insured group medical plan, life, medical and dental, accident and disability insurance, and HSA saving accounts for 600 plus employees. Working closely with insurance carries and broker’s to resolve errors in claims for a self-insured plan. Coordinating human resources procedures to initiate benefits such as profit sharing, disability insurance, medical and life insurance. Providing benefit orientations, enrollments, and claims processing of insurance. Processing and maintaining all status reports and pay changes, both on computer and paper system. Preparing and maintaining employee files, assuring accuracy, compliance and confidentially, i.e. : unemployment claims, verifications, i9 status, and state regulations. Updating and maintaining employee files regarding the tracking of raises and assist payroll specialist with benefit deductions or additions in company payroll system. Preparing and maintaining bi-weekly employee listings, new hire, and absentee reports. Coordination of all open enrollment benefits meetings and enrollments at all locations, ensuring 100% participation. Maintaining and updating company organizational charts, phone directory and other requested reports as needed. Headline : Benefits Manager with 7 years of experience seeking an Office Manager or Executive Level Assistant position that utilizes all of my high-level office skills. Oversaw administration of employee benefit programs, including health welfare plans. Spend accounts, voluntary accident and critical illness plans, 401(k), and RRSP) for approximately 2,500 employees in us and Canada. Managed disability and leave of absence programs in compliance with state and federal laws. Provided guidance to 10 hr business partners in 6 states, and Canada, regarding benefit and leave related issues. Evaluated insurance programs and strategize with corporate management and broker to find. Monitored vendor relationships, including third-party administrators to ensure performance. Coordinated open enrollment, as well as prepared all communication materials related to open. Stayed up-to-date on changes affecting employee benefits and leaves of absence, and propose. Created, reviewed, and coordinated distribution of employee communications. Summary : Benefits Manager with 16 years of experience is seeking to secure a position with an established organization and a stable environment that will lead to a lasting career. To be part of an organization that provided challenges that will lead to advancement and career growth. Exceeded senior leadership goals by coordinating statewide medical events for over 4000 personnel resulting in 93% medically ready personnel. Planned and coordinated logistics for board meetings, committee meetings, and staff events. Coordinated domestic travel arrangements, including booking airfare, hotel, and transportation. Conducted orientation sessions and organized on-the-job training for 55 new hires which ensured a smooth transition to the organization. Selected and assigned 75 instructors to conduct specific training programs. Trained 25 new hires to perform cross-training exercises with experienced workers. Summary : Benefits Manager in Education domain who has 20 years of experience in benefits administration, and has a natural affinity for engaging management style. Develops executable strategies that motivate teams individually and exceeds objectives to employ outstanding customer service. Worked in partnership with HR Director to create, implement, and manage improved hr strategies, services, and programs to support the workforce during a downward trend and large-scale turnaround effort. Administered all benefit programs including medical, dental, vision, life, section 125 cafeteria plan (FSA), voluntary retirement annuities, Alabama state retirement plan, disabilities, employee assistance program and cobra. Analyzed federal and state regulations to ensure human resources compliance. Served as the primary point of contact for insurance billing, claims, reimbursements, and coordination of benefits. Recommendations also afforded employees over 50% of savings in monthly out-of-pocket expenses for health insurance premiums. Provided HR leadership during a period of rapid growth with a positive increase in annual revenues and gains in profitability. Coordinated campus-wide educational training seminars to keep employees abreast of benefit changes. Encouraged 90% of employee participation and decreased daily office visits astronomically. Managed benefit deductions, reconciled invoices, and resolved discrepancies. Facilitated effective coaching and training presentations on benefit plans and human resources policies/procedures. 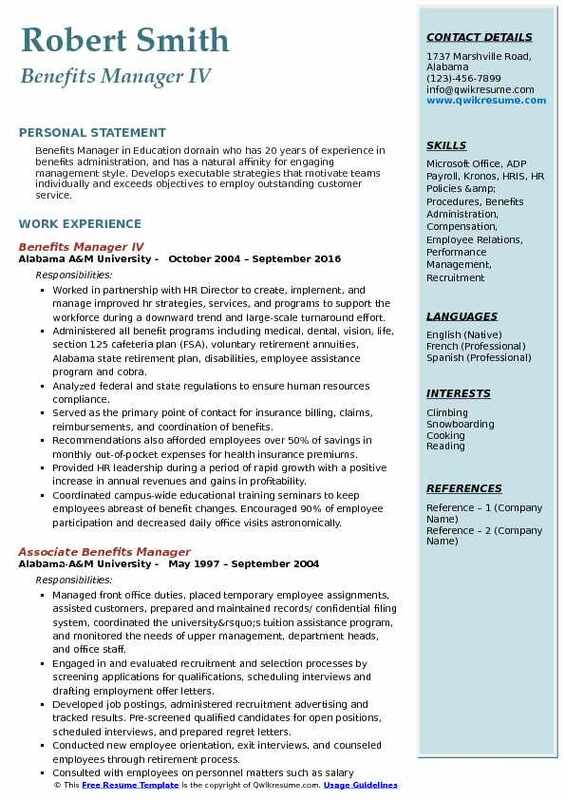 Summary : Employee Benefits Manager with 7 plus years of experience is seeking to join an organization offering both a challenge and an opportunity in an area where my experience and knowledge can be utilized towards a responsible career based on my successful performance. 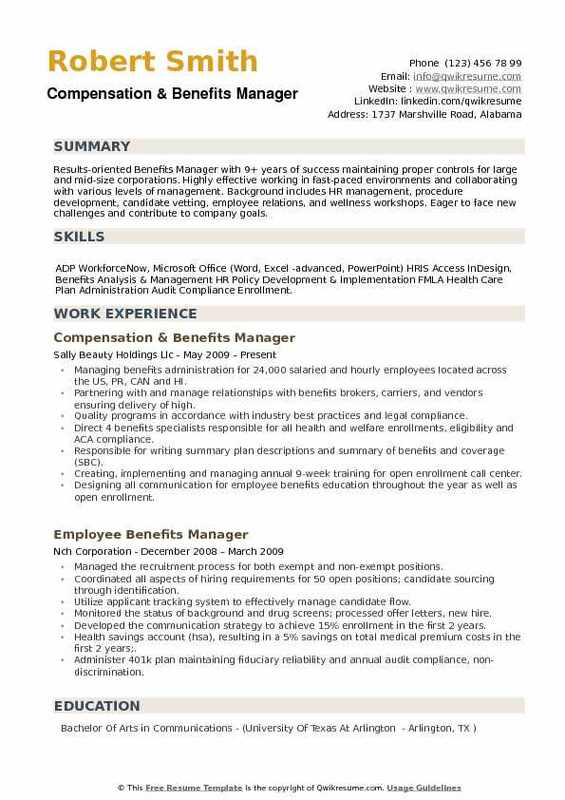 Skills : Account Management, Budget, Client Relations, Needs Assessment, Project Management, Lawson, Microsoft Office. Ensuring that all assignments are completed with the highest quality in a timely manner. Processing life insurance for all of the NYC transit (ie, TWU, ATU, SSSA, non represented career and salary, as well as, managerial employees). Responsibilities include administration of health coverage for managerial, non represented and all unions, totaling approximately 54,000 active employees. Conducting benefits orientation meetings for all newly hired and promoted employees. Maintaining employee benefit files, process claims and a variety of reports. Validating, process claims, maintaining data and other transaction inputs. Managing relationships with various health plan carriers to evaluate, clarify and resolve administrative and eligibility issues. Maintaining positive relationships with benefit vendors, internal business partners, and serve as a liaison in resolving employee benefits matters for customer satisfaction. Developing and updating operating procedures and training materials as needed. Assisting pension benefits with the walk-in center to determine their business needs. Objective : Benefits Manager with 3 years of experience is seeking a challenging position within a company that embraces diversity and provides opportunities for growth. Conducts audits of HRIS benefit system to ensure employee eligibility and benefits information accuracy. Develop and maintain vendor relationships to provide competitive benefit programs that support. Oversee and approve monthly premiums and claim payments in excess of $70m. Manage the benefits specialist team and their day to day work for health and welfare, leave. Partner with business units when negotiating collective bargaining agreements specifically. Serve as the main contact for HRBP and site leadership regarding plan guidelines. Lead the annual enrollment project to include communication strategy, host webinars, conduct. Identified, tested and proposed enhancements and corrections to benefits and leave set-up in hris system. Learned and took over all administration of the salaried defined benefit pension plan, which has over 900 participants. Summary : Proactive, results-oriented and accomplished Benefits Manager with 12 plus years of expertise and proven skills in all facets of benefit plan design, communication, regulatory compliance and administration of health and welfare programs and defined contribution plans. Skills : Microsoft Office, Kronos, Excell, Strong Communication, Record Keeping, ACA, ADP, COBRA, Training. Completing management of self-insured company benefits including medical, dental, vision, basic and voluntary life, basic and voluntary add, flexible spending accounts and short and long-term disability for over 4,500 employees in 83 locations. Ancillary benefits managed include vacation and sick leave, personal holidays, EAP, leaves of absence anFMLAla. Collaborating with an insurance broker, insurance carrier, senior vice president of accounting, president and chief executive officer on implementation and cost structure of all benefit plans. Coordinating open enrollment process for health and welfare plans, to include on-site enrollers, call center and online enrollment in a multi-site organization including the corporate home office. Determining plan structure during the renewal process that satisfies health care needs of employees and dependents while keeping costs down for both employees and company. 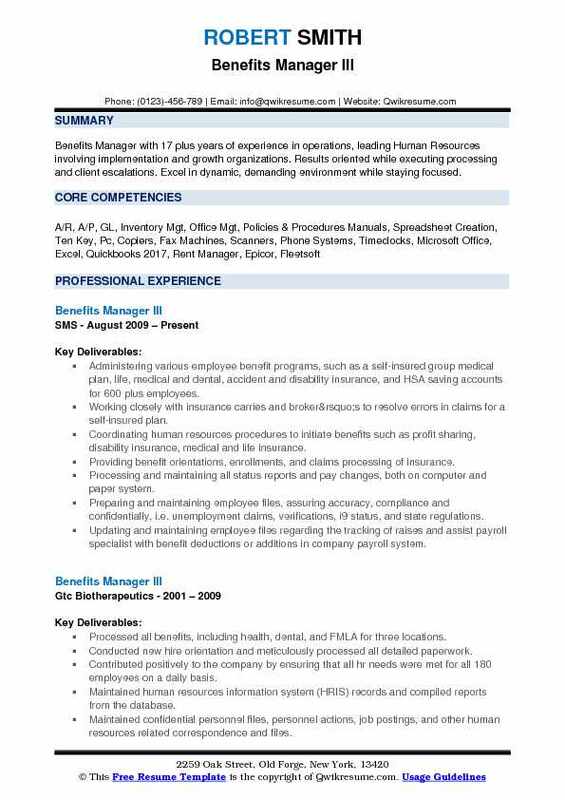 Managing HRIS analyst and FMLA coordinator to complete all tasks related to benefit administration. Developing and delivering on-going training for facility benefit administrators to onboard new hires at the community level. Assisting in the decision-making process on FMLA and leaves of absence to ensure employee and company were in compliance with federal regulations. Oversee the 401 (k) and retirement/savings plans including managing vendor performance, enrollment, termination, presentations, internal and external audits, testing, compliance and 5500 preparation. Assisting with writing the summary plan descriptions, filing form 5500s, administering plans in compliance with ERISA and other government regulations, and maintained necessary benefit records and files. Summary : Detailed oriented Human Resources Benefits Manager with 10 years experience in benefits and payroll administration. Assures ongoing compliance with Federal and State laws. Skills : Strategy Planning, Benefits Design, Contract Management, Program Analysis, Implementations, HR Communications , Staffing, Procurement and Legal, External Business Partners,Project Management Vendor Management, HR Operations and HRIS, Mergers and Acquisitions. Evaluating, developing and implementing benefits processes and procedures for campus and ensure compliance. Serving as the health benefits administrator for the college and be knowledgeable about the provisions of various fringe benefit plans (i. E. Health, life, dental, vision, flexible spending, disability coverage, retirement). Counseling employees regarding retirement options and submit the appropriate paperwork. 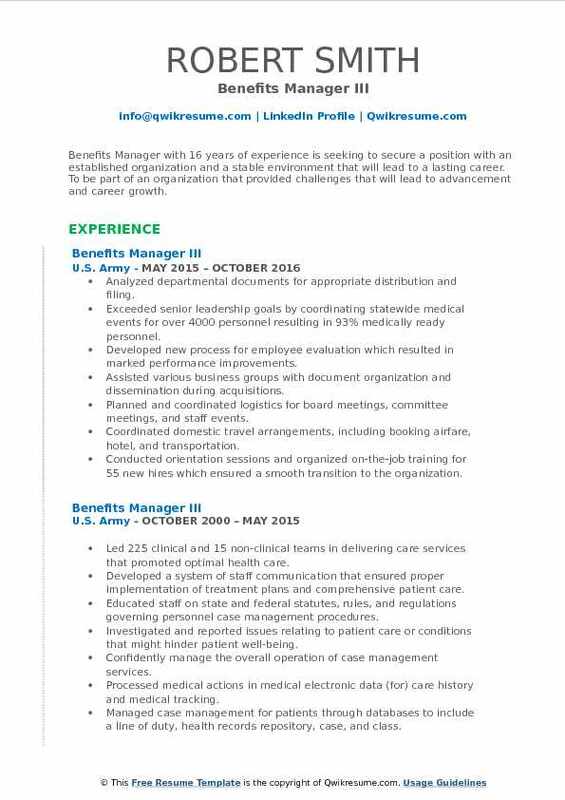 Informing employees of their benefits options regarding leave of absence and military leave. Ensuring benefits communication to employees is proactive and meaningful and ensure that employee questions and concerns are addressed on a timely basis. Working with the department of civil service to resolve transaction issues (i. E. Benefit correction requests, special deductions, domestic partner enrollment tax implications, national medical support orders, etc. ). Communicating all benefits announcements to the campus community (new rates, open enrollment, flex spending enrollment, etc. ). Working closely with broker and vendor on 401k plan changes, benefit renew, ls and open enrollment. Responsible for 401k administration, education, enrollments and serve as a member of the 401k advisory committee. Providing the highest level of service in benefits administration and employee assistance. 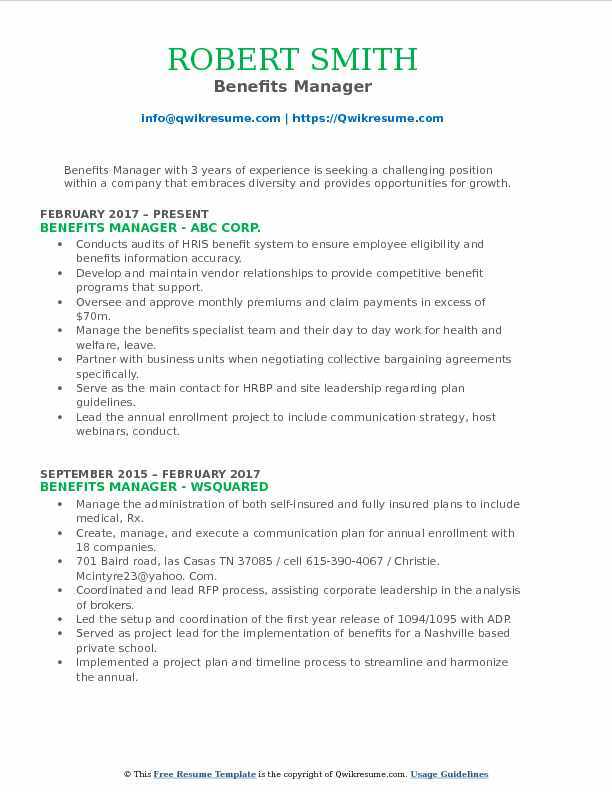 Summary : Results-oriented Benefits Manager with 9+ years of success maintaining proper controls for large and mid-size corporations. Highly effective working in fast-paced environments and collaborating with various levels of management. Background includes HR management, procedure development, candidate vetting, employee relations, and wellness workshops. Eager to face new challenges and contribute to company goals. Skills : ADP WorkforceNow, Microsoft Office (Word, Excel -advanced, PowerPoint) HRIS Access InDesign, Benefits Analysis & Management HR Policy Development & Implementation FMLA Health Care Plan Administration Audit Compliance Enrollment. Managing benefits administration for 24,000 salaried and hourly employees located across the US, PR, CAN and HI. Partnering with and manage relationships with benefits brokers, carriers, and vendors ensuring delivery of high. Quality programs in accordance with industry best practices and legal compliance. Direct 4 benefits specialists responsible for all health and welfare enrollments, eligibility and ACA compliance. Responsible for writing summary plan descriptions and summary of benefits and coverage (SBC). Creating, implementing and managing annual 9-week training for open enrollment call center. Designing all communication for employee benefits education throughout the year as well as open enrollment. Advise and counsel management and employees on existing benefits as well as conduct monthly onboarding. Reconcile monthly budget as well as third-party sick pay for end of year reporting. Assisting in annual benefit plan renewal and implementation of new plans and vendors.